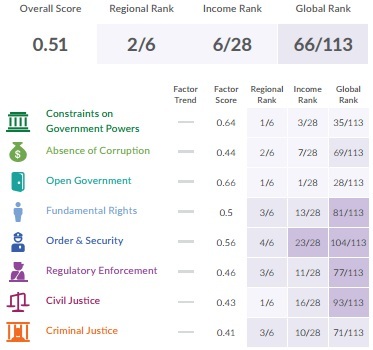 In the latest rule of law index (RLI), worked out by World Justice Project (WJP), a Washington-DC based independent, multidisciplinary organization, has ranked India 66th among 113 countries it has analyzed, far better than all neighouring countries except Nepal. The nearly 300-page report ranks Pakistan 106th, Bangladesh 103rd, Sri Lanka 68th, Nepal 63rd, and Myanmar 98th.Among the “comparable” BRICS (Brazil, Russia, India, China and South Africa) countries, India ranks better than two of the five – thus, Brazil ranks 52nd, Russia 92nd, China 80th, and South Africa 43rd. The Scandinavian ranks the best, with Denmark topping with No 1, followed by Norway, Finland, Sweden and the Netherlands. Then come Germany, Austria, New Zealand, Singapore and the United Kingdom. The United States ranks 18th, while Canada ranks 12th and Australia 11th. Calculated on a scale of 1, India’s RLI is 0.51. “The country scores and rankings for the WJP Rule of Law Index 2016 are derived from more than 110,000 households and 2,700 expert surveys in 113 countries and jurisdictions”, says the report. It further says, “Scores and rankings organized around eight themes: constraints on government powers, absence of corruption, open government, fundamental rights, order and security, regulatory enforcement, civil justice, and criminal justice. While India does quite well in the constraints on government powers factor, ranking 35th, suggesting it has effective of the “institutional checks on government power by the legislature, the judiciary, and independent auditing and review agencies”, it does falters in regulatory enforcement, ranking a poor 104th. The regulatory enforcement factor measures the extent to which regulations are effectively implemented and enforced without improper influence by public officials or private interests. India also does quite well in open government factor, ranking 28th, which means that basic laws and information in legal rights are publicized, and the quality of information published by the government. It falters in the absence of corruption factor, which considers three forms of corruption: bribery, improper influence by public or private interests, and misappropriation of public funds or other resources. Here, it ranks 69th. 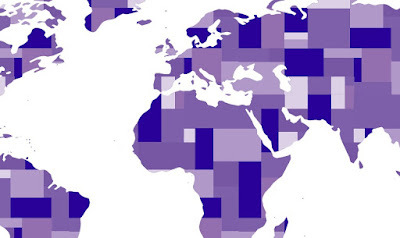 In the fundamental rights factor, India ranks 81st, suggesting, there is failure to protect fundamental human rights, including effective enforcement of laws that ensure equal protection, right to life and security of the person, freedom of opinion and expression, freedom of belief and religion, the right to privacy, freedom of assembly and association, and so on. In the order and security facto, which measures threats to order and security, including conventional crime, political violence, and violence as a means to redress personal grievances, India again ranks a poor 104th. In the civil justice factor, which measures whether it is the civil justice system is accessible and affordable, free of discrimination, corruption, and improper influence by public officials, India ranks 93rd. And, in criminal justice factor, which measures criminal investigation, adjudication, and correctional systems, India ranks 71st.